DOM is removed from streamwater by both abiotic and biotic processes. The principal biotic processes are uptake by microorganisms, assimilation of the organic C into microbial biomass, consumption of this heterotrophic production, and its eventual remineralization to CO2 by community respiration. DOC is also removed from the water column by abiotic sorption and transformed into other compounds by photodegradation. Dahm (1981) estimated that adsorption onto clays and chemical complexing with oxides of aluminum and iron accounted for up to one third of the initial removal of DOC from the water column. Over a period of several days, however, microbial uptake was responsible for the majority of DOC disappearance from the water column into the sediment layer. Photochemical degradation results in the transformation of DOC into other inorganic and organic compounds. Although it is not clear whether these organic products are more or less available to bacteria than the initial DOC, most studies conducted in freshwater systems using humic compounds or DOC from vascular plants have found that photochemical degradation enhances biological availability (Moran and Covert 2003). into such processes as leaf breakdown and biofilm activity (Findlay and Sinsabaugh 2006, Zak et al. 2006). In addition to surface biofilms, bacteria in the water column of rivers and attached to particles can process available DOC and potentially be important in food webs. Bacteria are responsible for a large proportion of ecosystem respiration in large rivers (Richey et al. 1990; Benner et al. 1995), and the quantity of C lost by respiration is nearly 13 times greater than total organic C transported by the Amazon River to the ocean (Richey et al. 2002). Carbon is generally considered to be an important limiting resource for bacterial production, and so variation in the quantity and quality of DOC and POC sources is of considerable importance. In addition, nutrients, temperature, oxygen, and many other environmental factors will influence the incorporation of these C sources into microbial biomass. 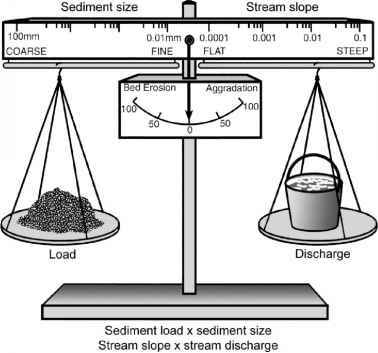 The following sections summarize current knowledge of microbial utilization of DOM, primarily by bacteria, on and within the streambed and in the water column. 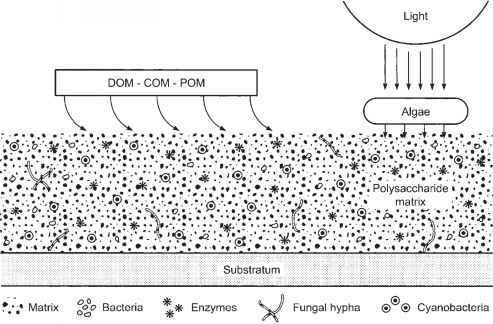 Because microorganisms commonly are associated with particulate matter, utilization of DOM does not separate easily from utilization of fine POM.